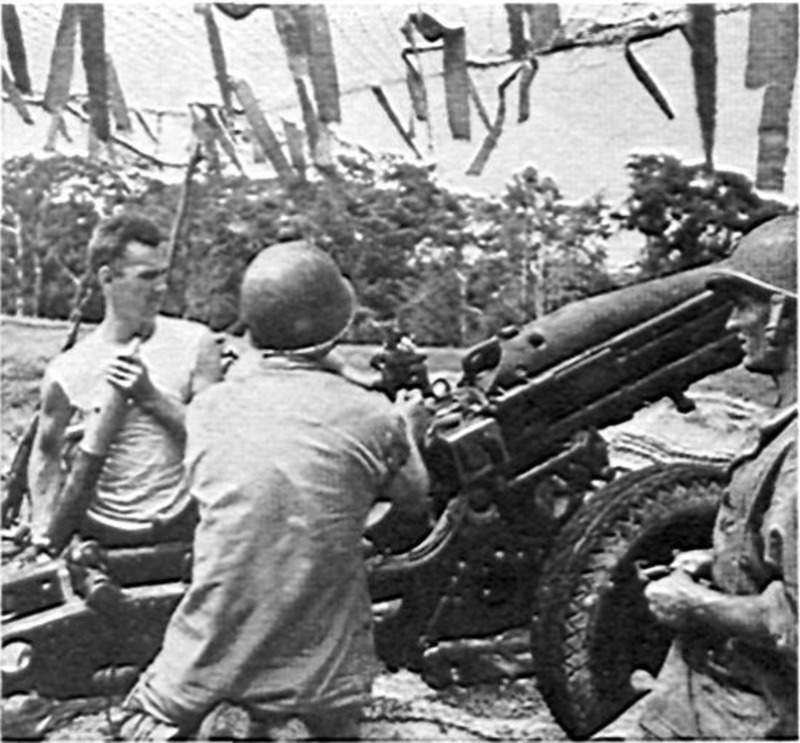 8 inch howitzer battery, Philippines, 1944. 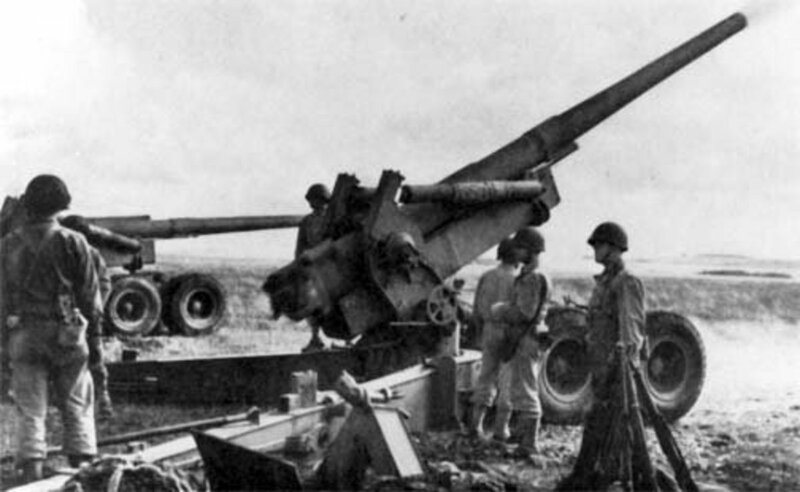 The use of artillery reached its zenith in World War II. The technical development between the world wars, particularly in the United States, created a system that was second to none. Time and time again in postwar interviews, German soldiers mentioned the fear that American artillery engendered along the front lines. They knew that as soon as an American spotter plane appeared over their positions, it would only take minutes before a massive barrage rained down death and destruction. There was no place to hide. The multitude of different caliber weapons combined with pre-configured firing tables meant no escape from its power. No matter how deep you tried to dig or how far you tried to run. One of the keys to the success of the artillery branch in World War II lay in the structure of the battalion and its personnel. 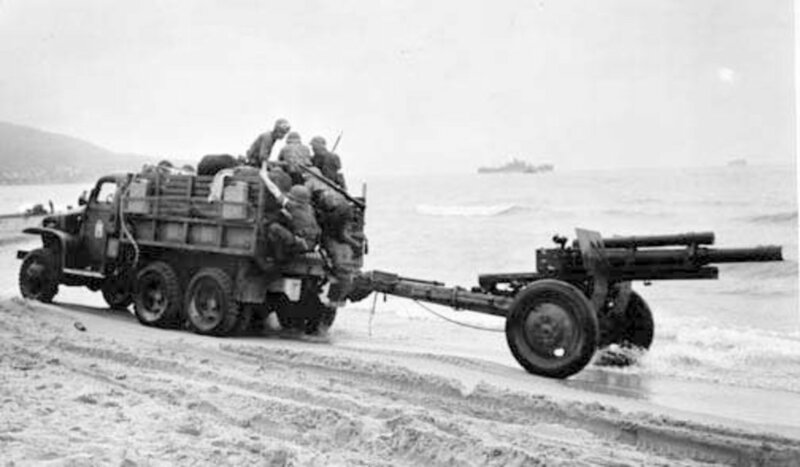 Whether it is within a division or as part of a Corps artillery group, the battalion was the primary unit structure for the artillery branch in World War II. Within those battalions were some of the most highly skilled personnel that the U.S. Army had throughout the war. Between the wars, there were important changes to the standard practices of the branch. Unit structure was evaluated, standard operating procedures were rewritten, and new technologies came on line. Regardless of the theater in which they operated, the branch was able to put all of these innovations into use. The size of the battalion depended on its main weapon. The bigger the gun, the more men you needed, though the basic battalion structure for both the 105mm M2A1 and 155mm M1 units was similar regardless of the gun. Each battalion had three firing batteries (4 guns each), a Headquarters battery (the CO and his staff along with the fire direction personnel, communications center, etc. ), and a Service battery (ammunition, basic supplies, mechanics, etc.). Batteries were further subdivided into sections. Battalions were usually headed by a lieutenant colonel with an executive officer who was usually a major. Batteries were headed by a captain with an exec who was a lieutenant. A 105mm battalion contained just over 500 men. Each battery had about 100 men, which broke down into five officers and 95 enlisted of various rank. 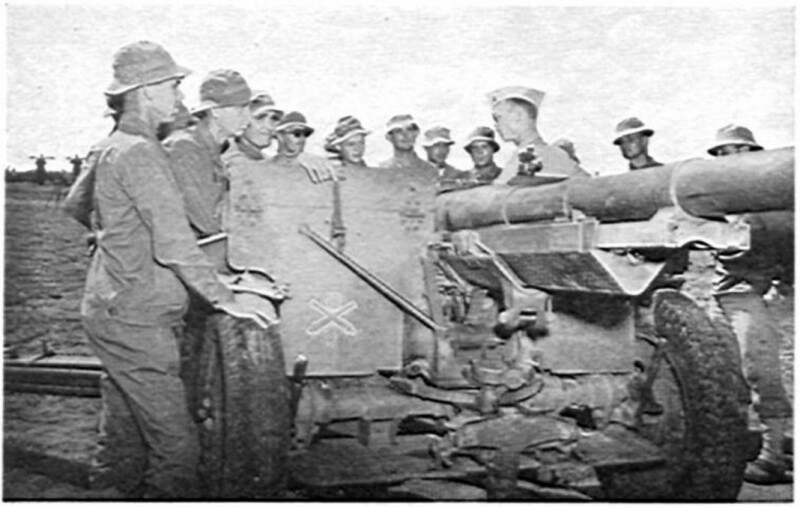 A 155mm battalion had approximately 550 enlisted men with 30 officers, with each battery having around 120 men. I use the word approximately because once combat operations began, it was rare for any unit (Division, Battalion, Regimental, etc.) to have a complete table of organization. There was a replacement system, but the exigencies of combat left all units in the combat arms (infantry, armor, engineer or artillery) short of men. 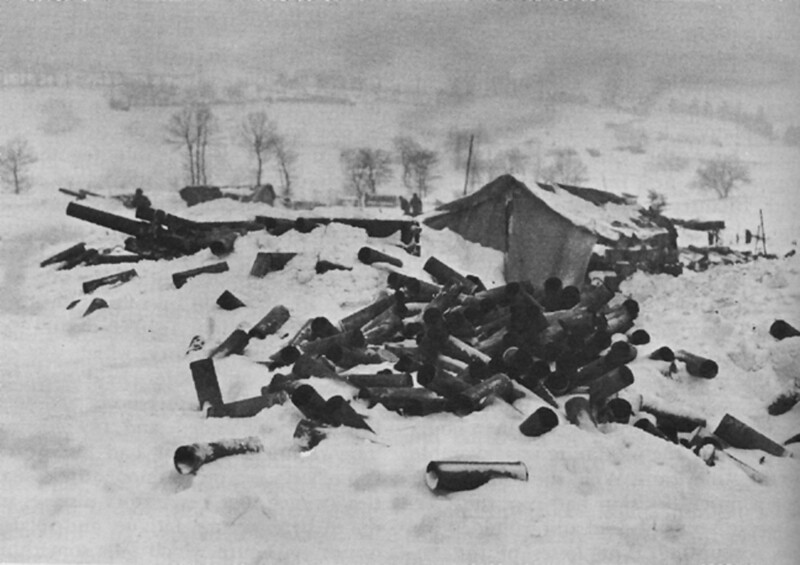 The Battle of the Bulge in December 1944 caused such a manpower crisis in infantry units that even some artillery units ended up sending non-essential personnel to the infantry as replacements. Within an infantry division, there were four artillery battalions, three M2A1 105mm howitzer battalions and one 155mm battalion. The three 105mm battalion were assigned to one of the three infantry regiments to support, forming a combat team. The assignments were made back in the States and continued upon deployment. The 155mm battalion supported the units or areas most in need at the discretion of the Division artillery commander (better known as Divarty). There were also units called cannon companies that used the M3 105mm, a lightweight, short-barreled version of the gun. In the first two years of the war, the 105mm self-propelled and 75mm howitzer were their main weapons. But they were part of the infantry regiment, and used at the discretion of the regimental CO. In theory it was supposed to provide supplemental firepower for the infantry companies. However in practice, they just never seemed to fit into the basic operations of the regiment and in many cases, ended up being used as perimeter defense. Using the vernacular of today, they could be described as a heavy weapons company on steroids. After the war, they were disbanded. Besides the four firing battalions, an infantry division’s artillery complement contained a Division Headquarters component. It consisted of a battery headquarters, operations platoon, communication platoon, an air observation section and a maintenance section. Included in the operations platoon was an instrument and survey section along with a meteorological section. 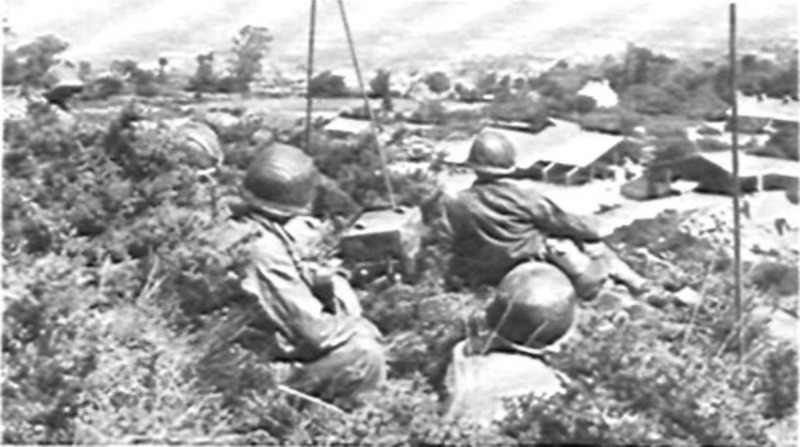 The communications platoon had the wire and radio section which was provided with over 30 miles of telephone wire and 4 radio sets. The supply and cooks sections rounded out the unit. The jobs of the enlisted members of each firing battery varied depending on their training and circumstances with many personnel being cross-trained to do a variety of work. Each gun crew was considered a section and within each section there was a sergeant (Section Chief), a gunner corporal and assistant gunner (known as the #1), two other assistant gunners and three cannoneers. A driver and assistant driver rounded out the 105mm section, making for a total of nine men. Although requiring more personnel and having some technical differences (i.e. external powder bags), the duties of the 155mm crews were essentially the same. No. 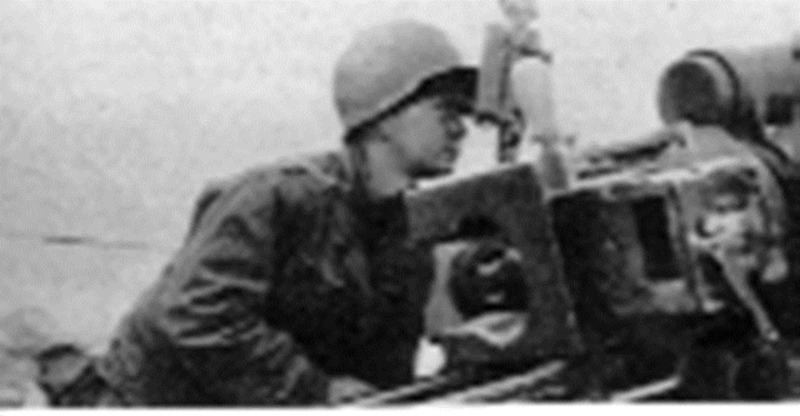 1 gunner on a 105mm (M2). He's to the right of the breech responsible for elevating the gun and attaching the firing pin. Top of the safety plate can be seen upper right. Behind the safety plate, on the left side of the breech, the gunner corporal worked a telescopic sight known as the gunner’s quadrant (or gunner’s scope), containing an azimuth scale that measured horizontal deflection, which he set on orders from the firing officer. Officially, it was called the M12A2 panoramic telescope. It could be rotated manually 360 degrees. The sight had an alcohol bubble which he had to level prior to firing while using number wheel to traverse the tube left or right. Red and white aiming posts were laid to the rear of the sight, almost in a straight line. One aiming stake was approximately 30 to 40 yards back while another was placed halfway between the gun sight and the other stake. The position of aiming posts could vary depending on the unit and terrain. Upon receiving the orders from the firing officer such as Command Left 10 or Right 20, the key task for the gunner was to get the aiming stakes and the gun sight lined up on the vertical crosshair in the scope. If the command was left 10, the head of the site would then be moved off of the aiming stakes by that many degrees. Then he would use a hand wheel to traverse the gun left. Looking through the sight once again to determine that he was still lined up with the aiming stakes, his last task would be to level the bubble, and shout ‘Ready!’ This told the Section Chief that the gun was ready to fire; he then held up his right arm as a signal to the gun crew. Keeping the gun aligned properly was a difficult task when under the pressure of multiple fire missions, so the gunners had ways of cheating a little bit. Where possible, they could set the scope on a fixed target (e.g. Church steeple) and line up the angle on that. The wide dispersal of an exploding shell, which could be more than 50 yards, gave the gunners room to be off a little bit. While the gunner corporal worked his sight, the assistant gunner, positioned on the right side of the breech, operated a hand wheel to set the elevation. During the relay of firing commands, included were terms such as Up 15 or Down 5, from the zero. Once the orders were received, he would spin his wheel to the correct angle. But his task did not end there; he also operated the breech block, set the primer and pulled the lanyard upon the order, Fire! Both he and the gunner corporal were also responsible for keeping the crew away from the tremendous recoil of the barrel which could kill or maim, especially in the 155mm. After firing, the breech was opened by the #1 and the shell casing would drop out automatically, where it was picked up one of the loaders to be tossed aside. 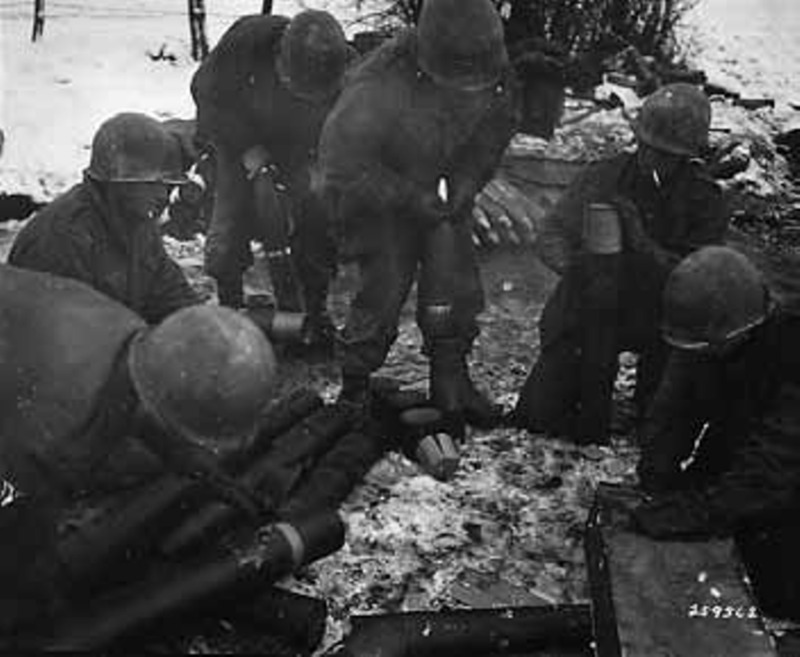 105mm ammo crew arming shells during the Battle of the Bulge (591st FAB -106th ID). Love the cigarettes around all that powder. 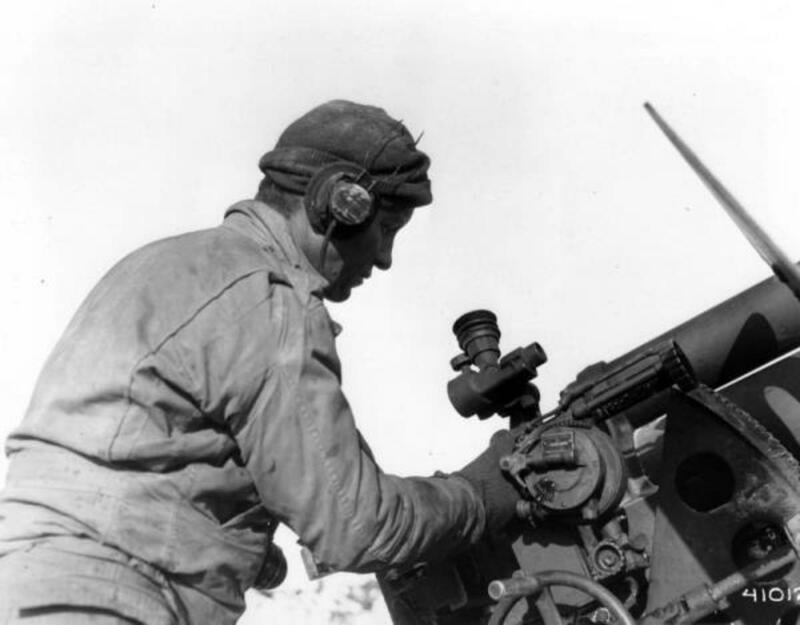 240mm howitzer preparing to fire, January 1944. 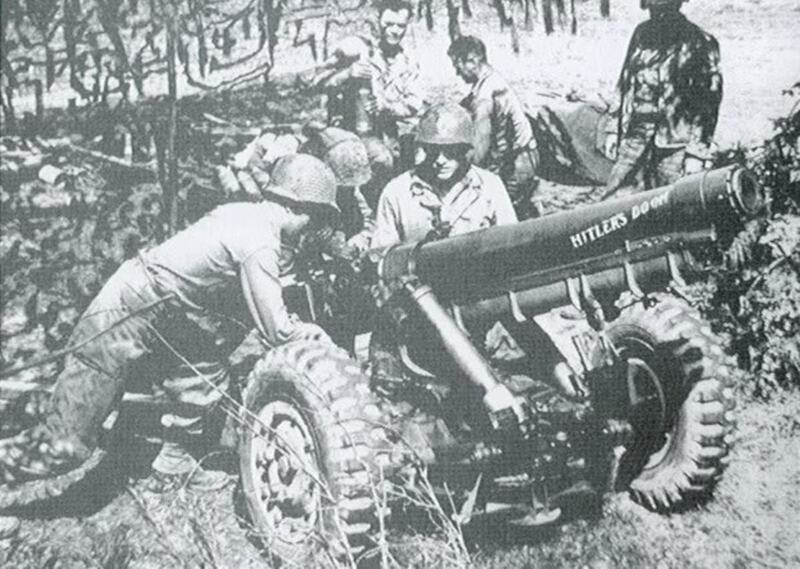 This was the largest field gun in the U.S. inventory during the War. The two assistant gunners and three other cannoneers in the section were responsible for packing the shells with powder bags, setting the fuses according to the mission specifics and loading. 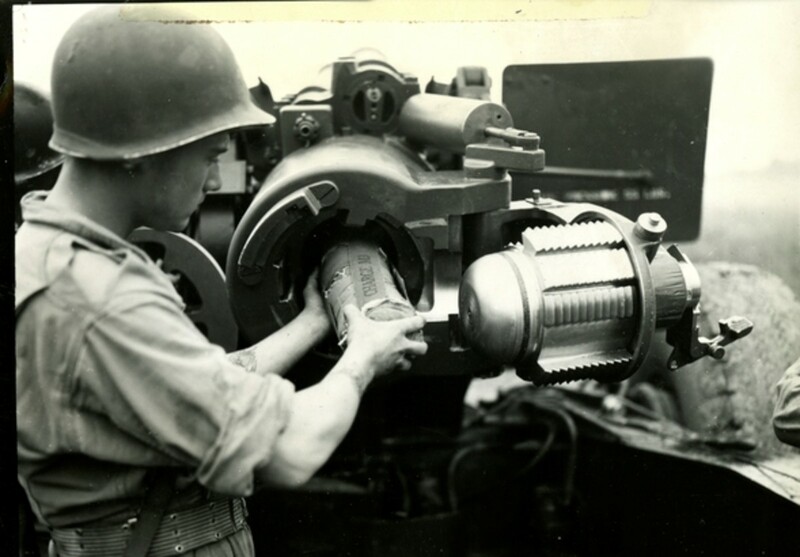 Although the shells were shipped semi-fixed with the fuse already installed, it was the powder that provided the punch, so that had to be added to the shell. 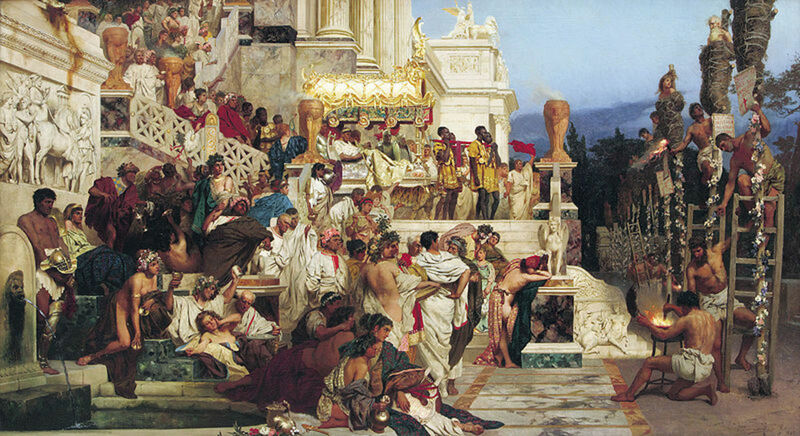 Each shell could take up to seven bags of powder, which were wrapped in silk and tied together. Maximum range for the 105mm was approximately seven miles (12,205 yds). The ammo men would disassemble the shell, pack the bags based on the firing orders, and reattach the fuse. Then the fuse had to be set using a special wrench. 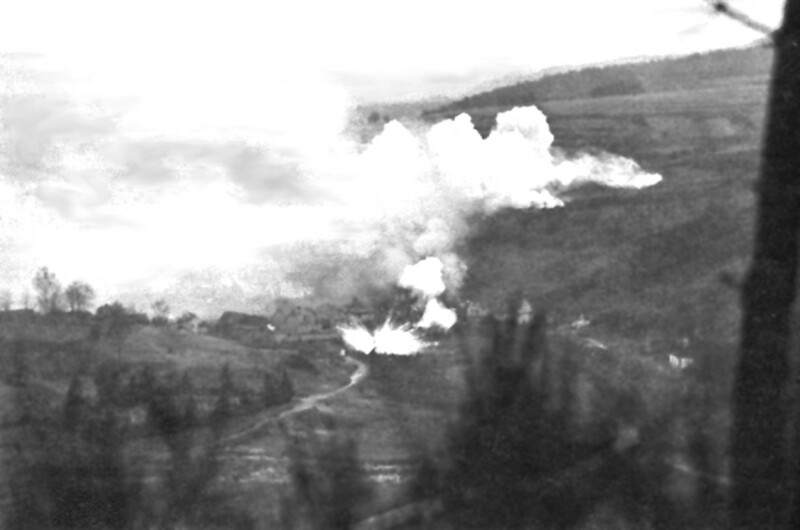 The majority of the shells expended during fire missions were usually high explosive (HE). There was a setting sleeve located at the base of each fuse. On an HE round, the ammunition crews could set it for either point detonating (PD) or time superquick (TSQ). This depended on how it was turned. For example, if the setting sleeve was turned parallel to the shell, it was set for superquick. Under the pressure of a fire mission, these tasks were hellish in the freezing, wet weather of Northern Europe. If your frostbitten hands were not already cut up from separating the silk powder bags with a knife, you got soaked kneeling down in the puddles and mud that formed around the gun pit. The crews on the 155mm had different challenges. Extra men were needed just to carry the shells. The 95-pound shell required separate-loading bagged charges that were loaded with the shell according to the orders given by the firing officer. There were seven different propelling charges, with TNT being the most frequently used. 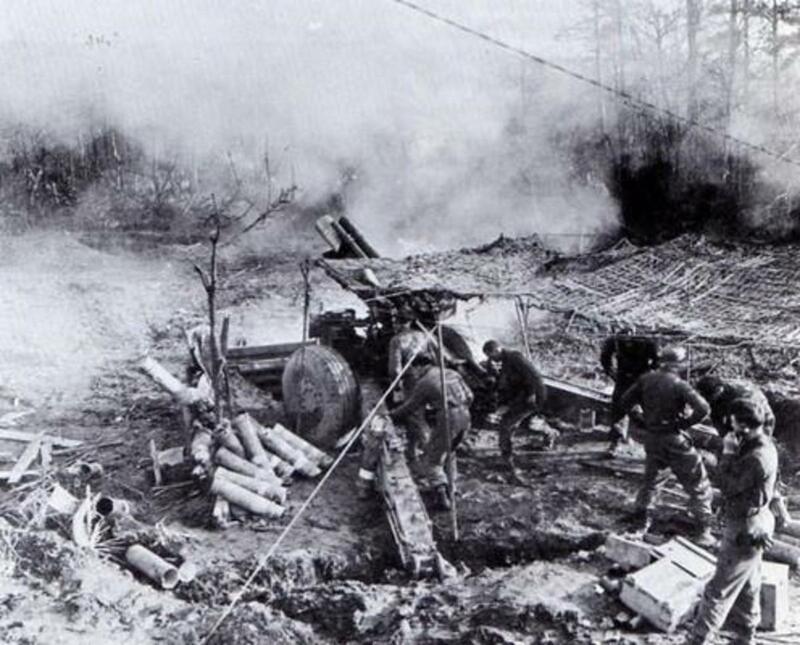 It was the sheer weight and logistics involved with the operations of the 155mm ammo that was daunting. 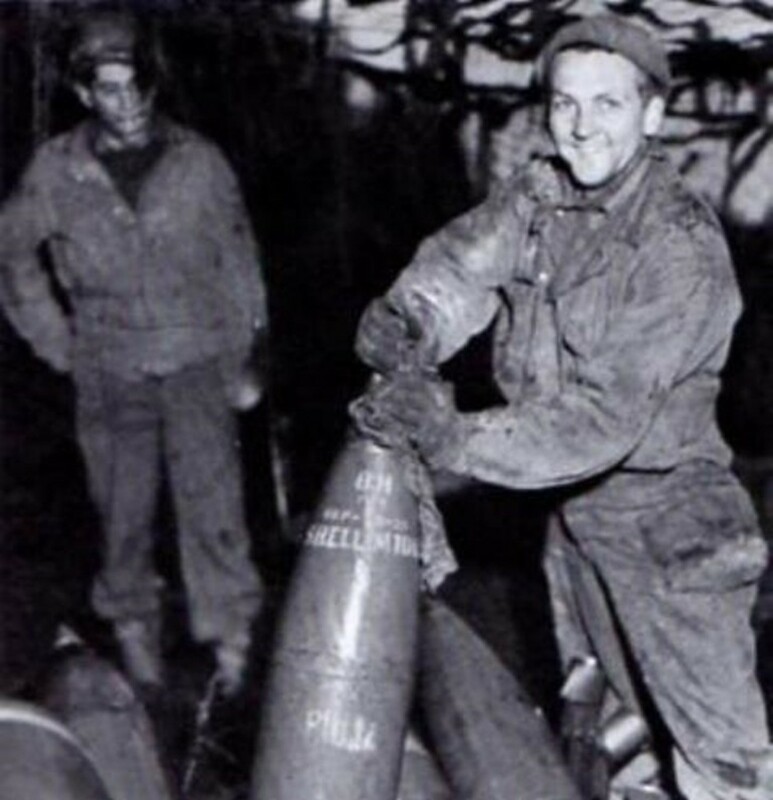 Shells were usually shipped in pallets, with eight shells per pallet. At the ammo dumps, these were broken down for shipment by truck to the batteries. A truck could carry between 50 and 60 shells per trip. The fuses were shipped in crates, about 25 per box. The shells had lifting rings attached at their nose during shipment, and they had to be removed to install the fuse. 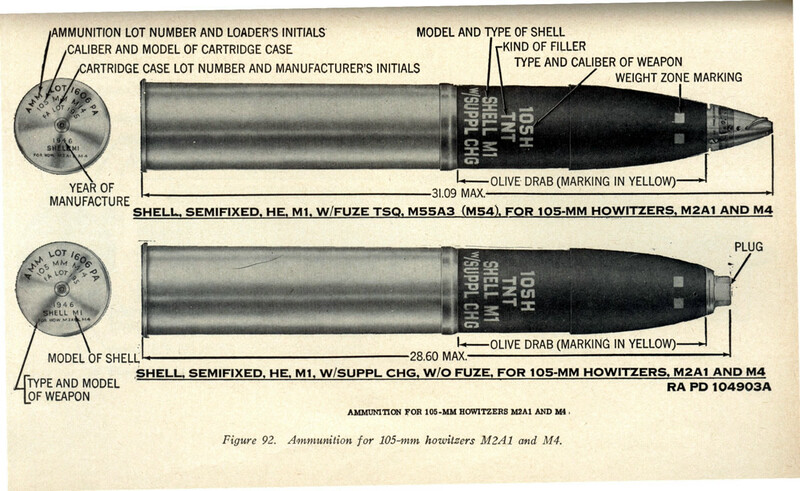 As with the 105mm, color markings were used to differentiate the type of shells. The setting sleeves also mirrored those on the 105mm ammo. 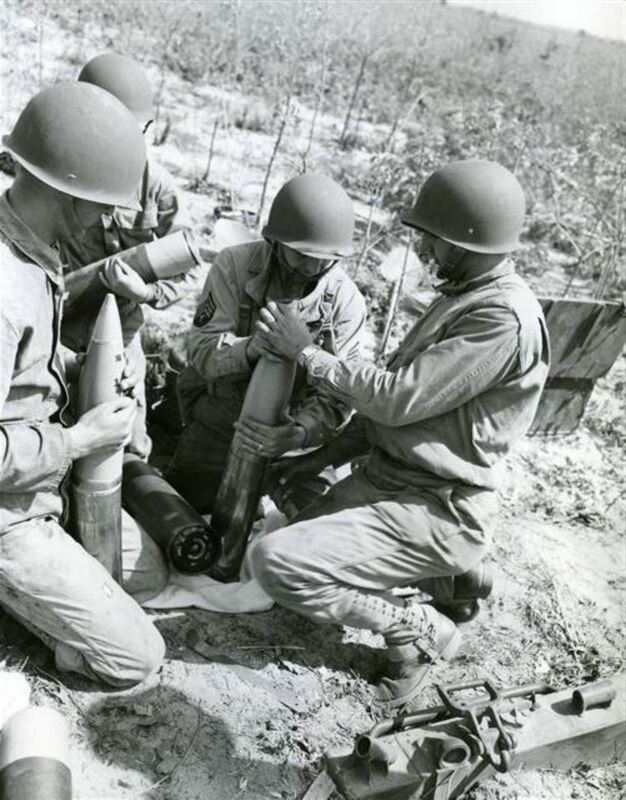 Because of the separately loaded powder, it was vital that the powder chambers of the 155mm tubes be swabbed and inspected after each round was fired. If too much powder residue built up in the barrel, it could cause a catastrophic explosion when a round was fired. Amazingly, those incidents were relatively rare considering the near constant use that most of the weapons received. 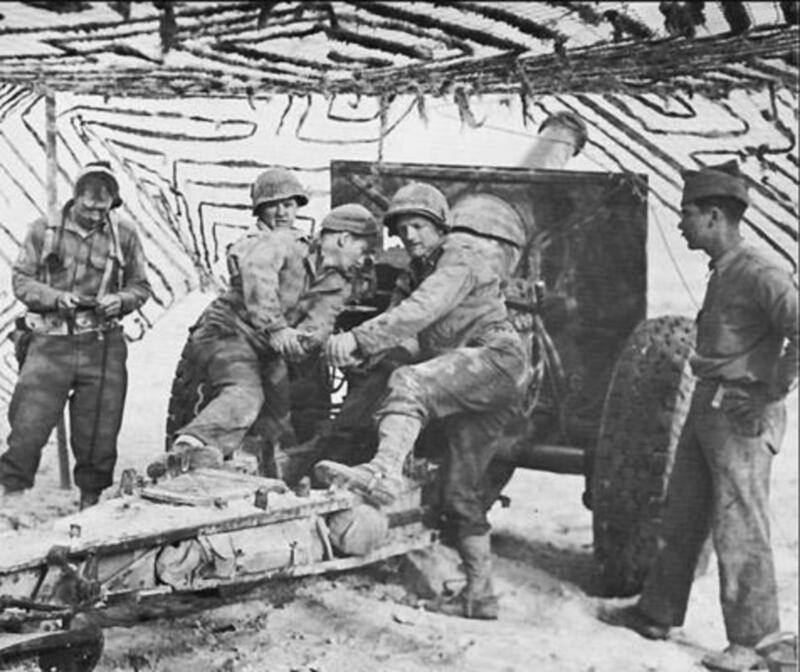 Other battery and battalion personnel included radiomen, wiremen, instrument operators (survey team), cooks, drivers, and mechanics. Many of the specialists were also grouped into sections and personnel from both the communications section and survey teams often were part of forward observation teams. Artillery batteries also had a fifth section, which was called the machine gun section. They were responsible for guarding the perimeter and hauling extra ammo. One of the primary jobs of the instrument and survey section (also called the detail section) was to scout new positions for the battery, help lead the battery into and out of their firing positions, and lay in the guns. The skills of these men also translated into high quality artillery observers. They were also charged with conducting topographical surveys, which during combat operations were carried out rather infrequently. Upon arrival at a position, using such equipment as aiming circles, range finders, and other survey equipment like steel tapes and chains, the enlisted men of the section would lay in the guns to prepare them for aiming direction and elevation. Their officer would take a reading from the aiming circle so that the four guns of the battery would be aligned and shoot parallel with each other. The aiming circle was a small scope graduated with 6,400 mils as opposed to the usual 360 degrees (a mil is 1/6400 of a circle). It aids in laying in the guns by taking into account the Y Azimuth distance between true north and magnetic north. The reading was then given to each gunner while the howitzers were at zero deflection and a minimal elevation from level. Many of the other non-firing battery assignments came with a multitude of dangers and nowhere was that more illustrated than for the men of the wire section of HQ Battery. Their job was to lay, repair and pick up telephone line. An artillery battalion communications net was its lifeline and monitoring its operation meant constant vigilance. The risk of being spotted by enemy observers was ever present. Running a spool of black telephone cord from HQ to an observation post could put one under fire from mortars, machine guns, snipers, shelling, both friendly and German, as well as enemy patrols. The black telephone cables were constantly shot up and there were up to several miles of cable laid out between an observation post and the FDC or battery. Dense woods, thick mud and snow made repairing the lines physically demanding work. Finding the break in a line required both skill and a little bit of luck. Usually, two men were sent out. They would follow a dead line some distance, usually to a place that had just been shelled. From there, they would splice into the line with their own EE8A telephone, and crank it to ring back to their starting place. If they received an answer, they had to keep moving and the procedure was repeated until they did not get an answer. This indicated that the break was somewhere between where they were and the location of the last “Okay” call. The officers’ jobs within the battery varied. Despite the copious Army manuals and regulations that defined nearly every aspect of life, the Army still encouraged low-level decision making regarding daily operations of its combat units. Junior commanders were expected to use their own initiative. Although this concept was much more limited in the artillery branch than in other branches, in practice each battery’s CO had great autonomy on officer assignments. In many cases, the executive officer ran day-to-day operations and oversaw all firing sequences and missions. Just like the enlisted, the cross training of commissioned personnel was an essential element in every battalion. The other officers could be assigned to a variety of tasks, which included motor officer, daily maintenance, firing officer or forward observer. Duty as an observer usually occurred on a rotating basis for the officers of each battery within the battalion. 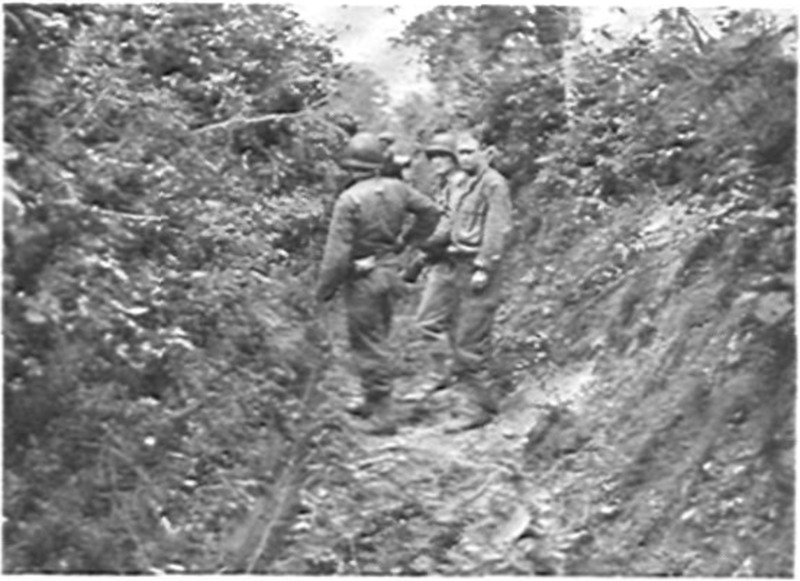 A lieutenant led the small team of 3 or 4 men to a forward outpost to spend up to several days manning a front line position. 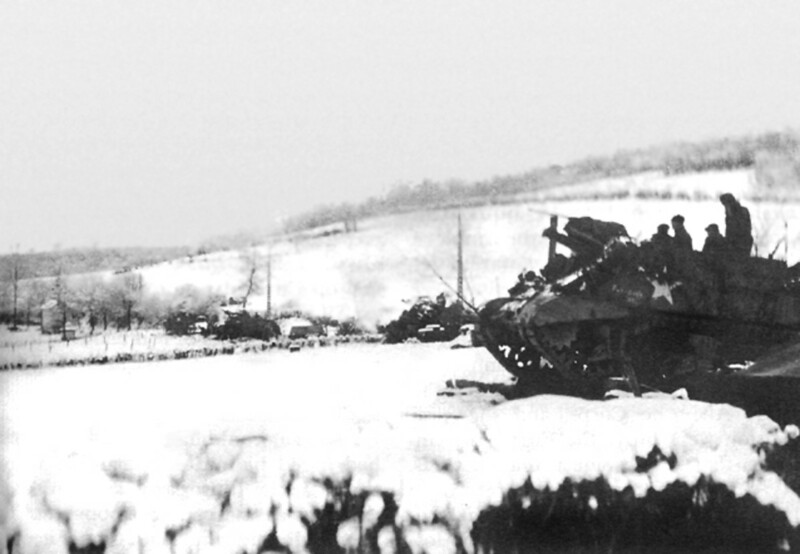 There was even an instance within the 106th ID when a battery commander was actually manning an observation outpost at the time of the initial attack during the Bulge. When the situation was more fluid, as was the case in the summer and fall of 1944, the observation team may stay with a particular infantry unit for an extended time. The majority of the officers within the artillery branch were highly skilled. If not West Pointers, many were from military schools such as the Virginia Military Institute (VMI) or the Citadel. Others were graduates of rigorous artillery ROTC programs from around the country. The Ivy League schools supplied the artillery branch with hundreds of officers throughout the war. Many others were reserve officers with established professional careers in civilian life. Later in the war, field commissions for qualified noncoms became commonplace. 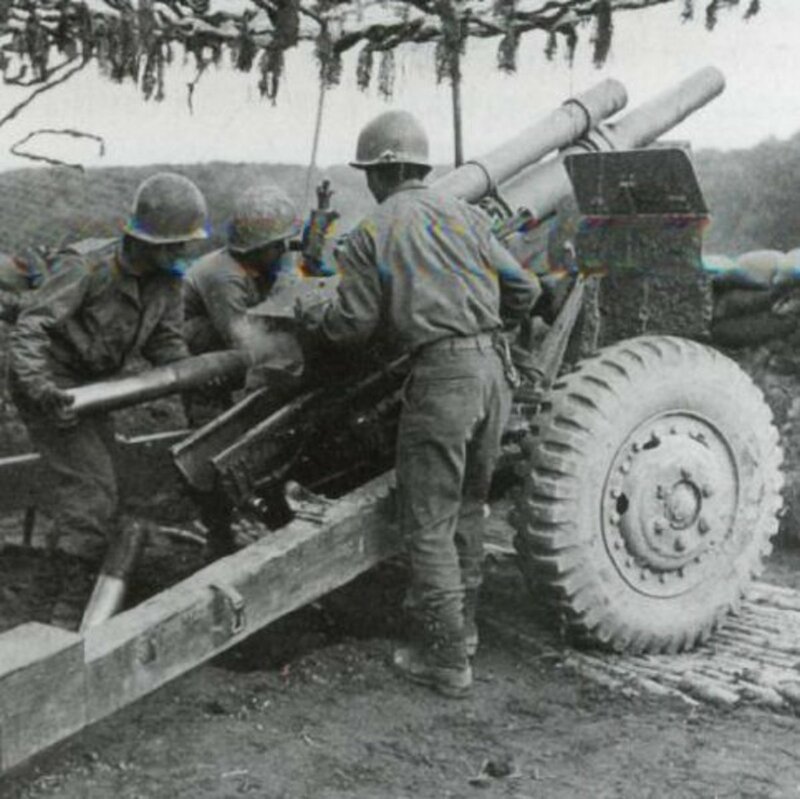 The Field Artillery OCS at Fort Sill (one of three during the war) produced 25,993 second lieutenants during the war years,which included over 3500 ROTC cadets who had completed between six and eight semesters of ROTC. Many of them had graduated from college, but had not completed the summer training after their junior year required for commissioning. To be commissioned those ROTC cadets had to attend OCS after going through basic training and AIT. Another key feature of American artillery during the war was the role of non-divisional artillery battalions of all calibers. These battalions were directly under the command of their respective Corps which had its own commanders and staff to coordinate all its elements. Battalions were also formed into field artillery groups of various calibers. The groups began forming in 1943. The command element of the groups was structured very similarly to that of a divisional artillery HQ with such features as fire direction center, H&H battery and service battery. A group was usually assigned from two to six battalions. One or more of the battalions of a group might be attached for direct support to an individual division. Such was the case with many African American artillery battalions. All of these units, regardless of their group or assignment, were considered Corps artillery. 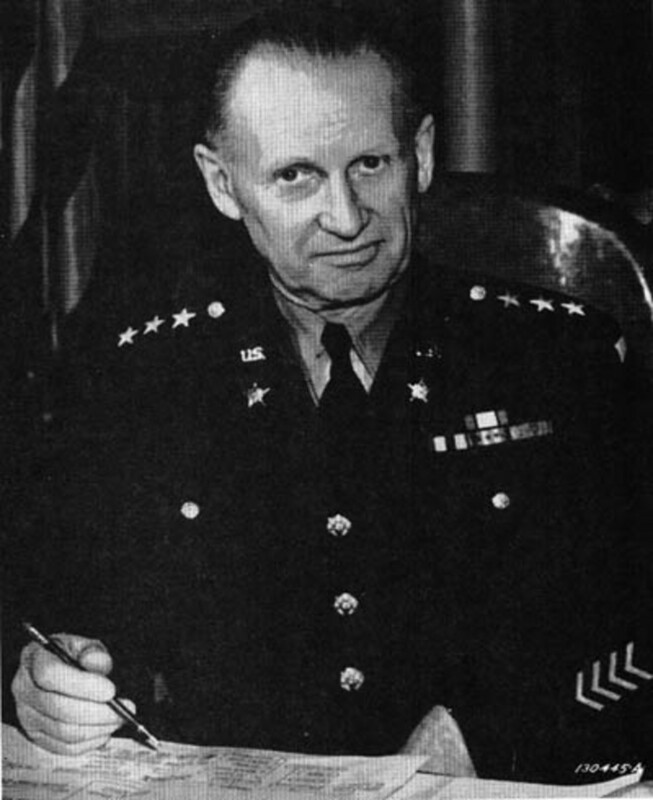 In a postwar study, the Army noted that the group command structure was one of the keys to success during the war because it permitted the commanders to shift artillery battalions from army to army, corps to corps or even to support individual divisions. This way the additional fire support went where it was needed quickly. 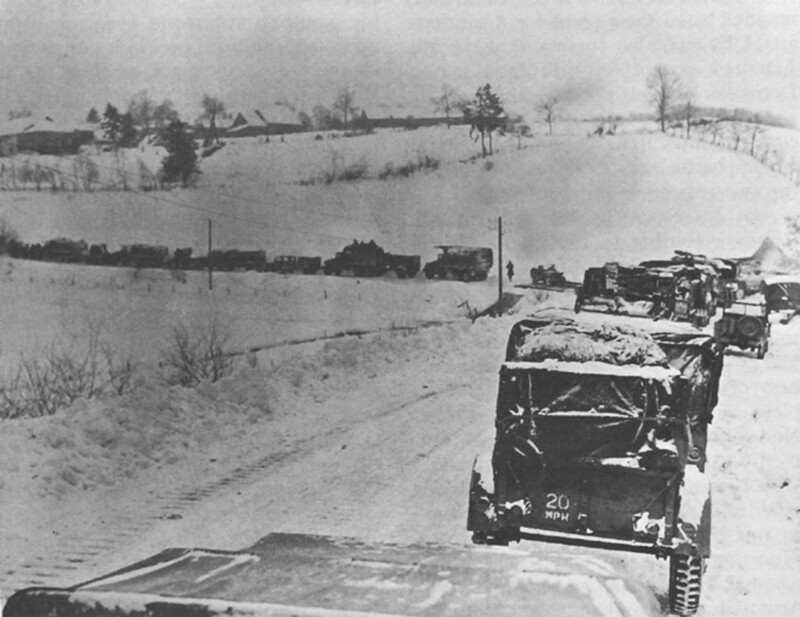 During the Bulge, many of these Corps units were on the move every 12 to 24 hours. 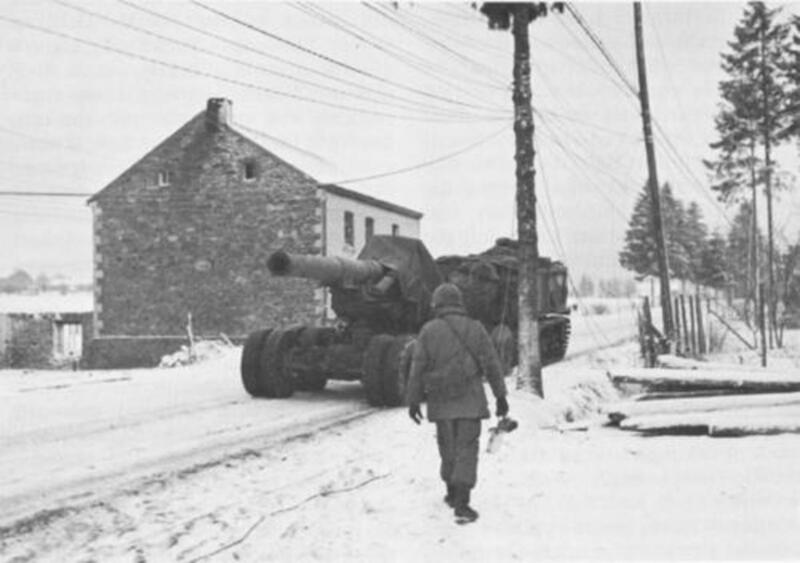 The shift of several large caliber artillery units, particularly segregated African American battalions, to Bastogne during the first 48 hours of the battle helped save the city from capture. 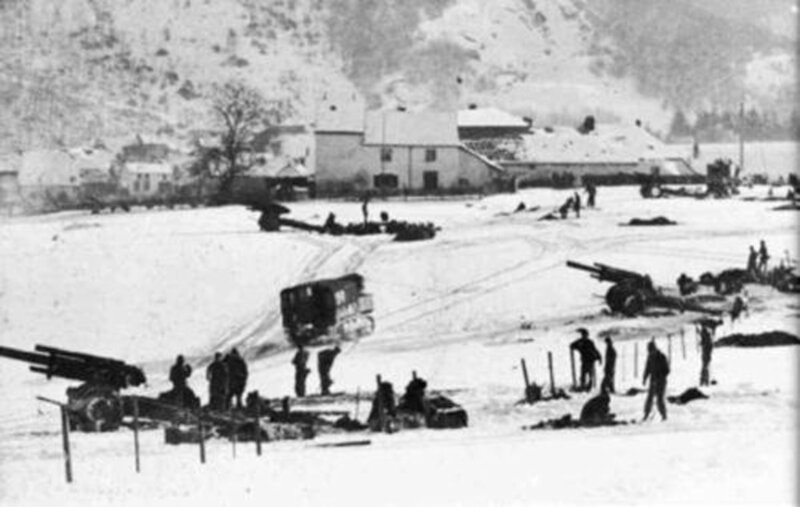 There were 238 separate field artillery battalions operating in the ETO by war’s end, with 36 105mm and 71 155mm battalions. This included self-propelled units such as the 275th Armored Field Artillery, who were positioned just north of the 106th. The other calibers were the 8 inch, the 240mm, and the 4.5 inch gun. 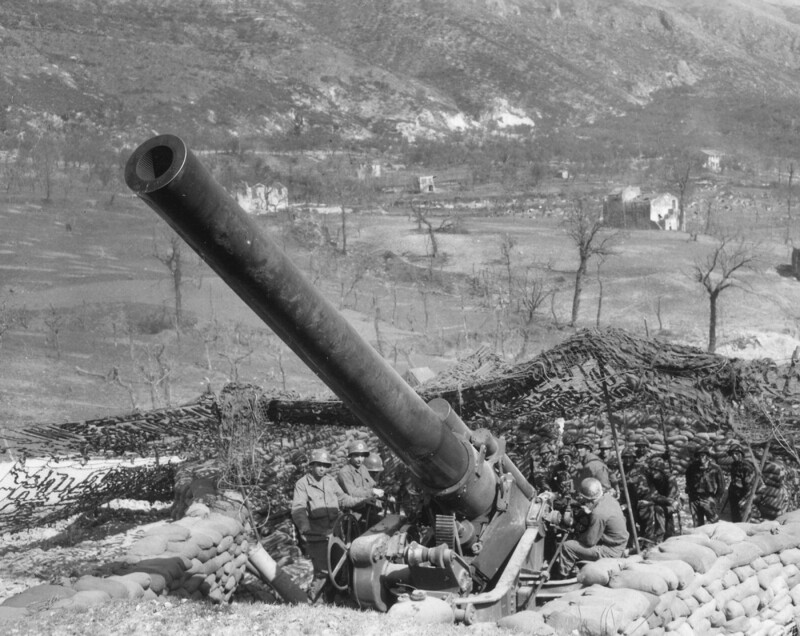 For the larger caliber units and the armored field artillery, the number of guns per battalion differed from those of the standard infantry division artillery. Armored field artillery battalions had the same command structure within their organic divisions as the infantry, but contained 18 self-propelled howitzers instead of the usual 12 for the towed variety. 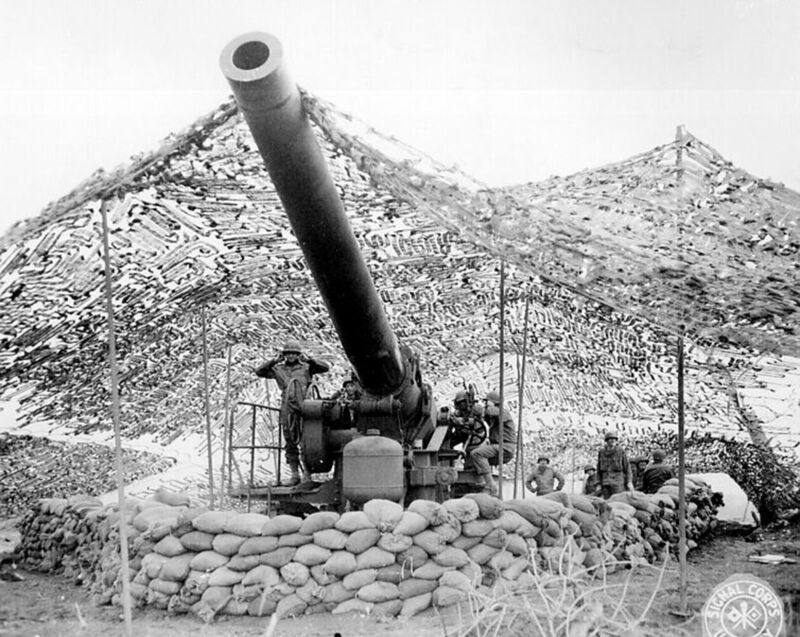 The 8 inch gun and 240mm howitzer battalions had a total of six guns per battalion. After the war, change came again. 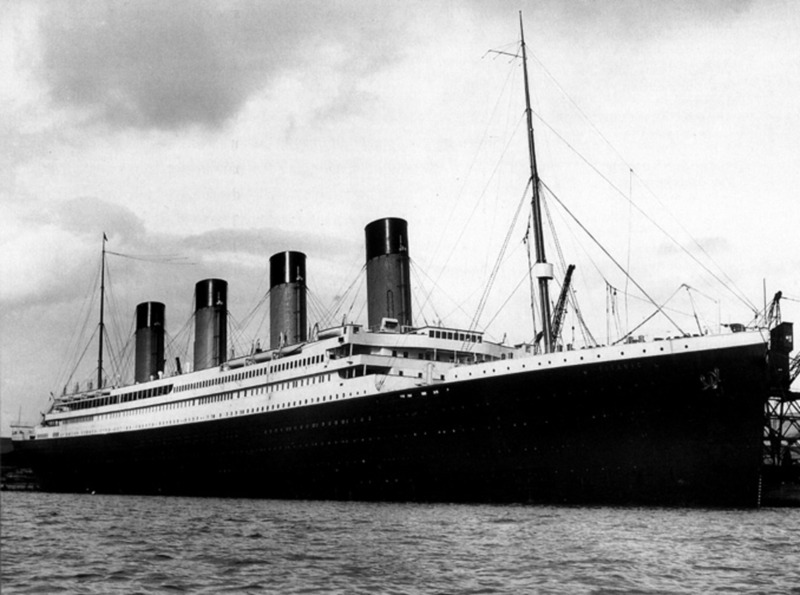 Guns continued to be improved while others were phased out. 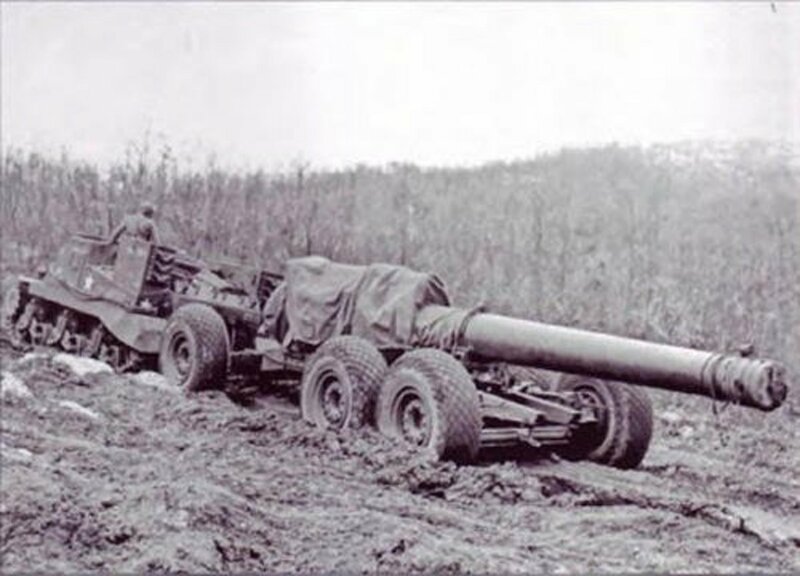 By the Korean War, they had added six guns to the standard battery. Self-propelled artillery took on a greater role and of course, missile and rocket technology changed the branch forever. But it was the work those battalions did in World War II that set the stage for the rest of the 20th Century and beyond. Dastrup, Boyd. King of Battle: A Branch History of the U.S. Army's Field Artillery. TRADOC 1992. Zaloga, Steven. 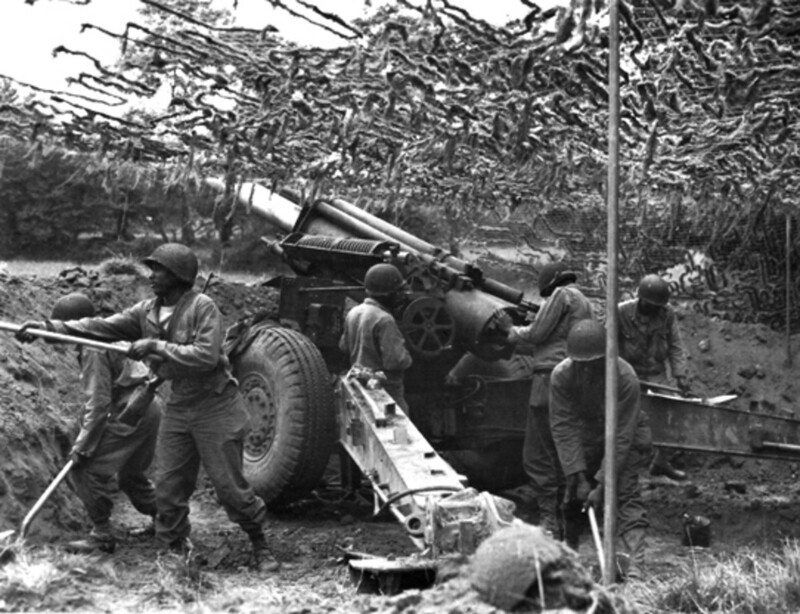 U.S. Field Artillery in World War II. Osprey 2007. Field Artillery Journal, March 1945. Field Artillery Journal, October 1943. 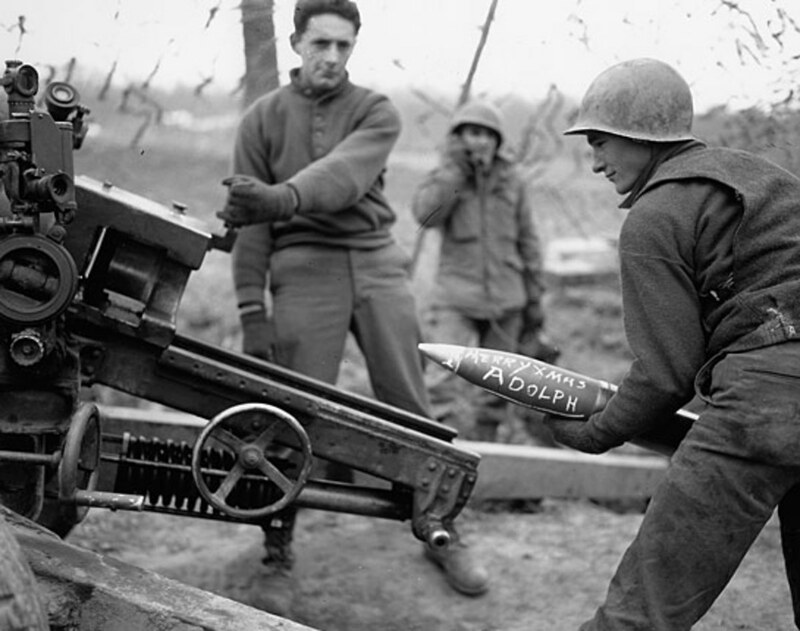 Military History Online, "US Army in World War II: Artillery and AA Artillery." Rich Anderson, 2007. John Gatens, U.S. Army Ret., Personal interview, October 17, 2011. John Schafner, U.S. Army Ret., Email interivews. Thank You for the links to the Artillery Battalions in the European Theater. I am assuming that my father was in a 3rd Army towed 155 mm battalion until VE-Day and then transferred to the 274th in Austria during the reorganization & disbanding of units. Thank You for your quick response. Hi Mr. Henry, thanks for stopping by. The locations are correct for the unit. The unit ended the war near Hitler's Eagles Nest. I will check the 20th Corps order of battle just to confirm. If you have any other questions, please let me know. Yes, most units had a yearbook published, one while in the State training. Some after the war. I've seen so many. Usually, one or two of the men had a copy years later and sent to the Association. So there must be one out there for the 908. Hi, I got a notice of a new post and after reading it scrolled down for others I may have missed. I saw one from Peter Lagasse, where he mentions a yearbook in connection with a FAB ("I already have the 1946 yearbook of the 15th FAB and also the 2nd Infantry Division book that was published."). Would such a book exist for all of the FABs? I would be interested in the 908 FAB if there is one! Hi Liaisonpilot, thanks for reading and commenting. I actually have several L-4 pics (not great ones), but I put the best one in another article, the Artillery Innovations article. But please send anyway. Several I have are a little blurry, etc. Fine article. Mention of how important to the success of the artillery was the role of the Liaison aircraft. There are lots of photos of guns and crews, but not one L-4 and pilot. I would be glad to furnish you with that. I'm going to assume you know these sites? I'll keep looking and get back to you. I believe the 15th FAB has a Facebook page too. I am doing a blog about the 100 letters my uncle Charles D Knight wrote home while in Europe in the 15th FAB section B using the 105mm howitzer. Their Division was the 2nd Infantry Division aka as the Indianheads. Any sources would be appreciated. I already have the 1946 yearbook of the 15th FAB and also the 2nd Infantry Division book that was published. I also have the two small booklets that were published about the 2nd Infantry Division. Thank you for any other sources that I can be directed to. For those of you who are looking for info. about practically any U.S.Army unit contact: jcontrovich@comcast.net. Jim has the largest library of unit histories anywhere. He may charge a fee to do a search. Hi Mr. Mercadante, glad to hear about your project. Please email at the address provided in my profile. I have info and other things I could help you with. Also, if you have a photo your dad, that would be great. Would you to feature him as a Red Leg of the Week on my page. I am researching the 259th Artillery Battalion. My father left behind a narrative of his service years. He was corporal gunner. '44/'45. I am interested in any info or interviews. My plan is to base a novel on his exploits and service. Any assistance will be appreciated. Would love it. You can email me. If you can't attach it on there, send me your email and I can get back to you. You should be able to find it on my profile page. Or you can go to FB, and message me. Red Legs of the Bulge FB page. CJK -- how do I send you a photo? I have zip skills but can usually figure out how to do that. I don't know if the few I have of my dad would do you any good because he is not in a fighting scene, but one time I think you remarked that you would like a picture. Sorry about that, I've been receiving one request per day lately. While exciting, it can get confusing. The 908th should not be a problem. I used to speak with two different librarians/assistants at the library in Fort Sill (I'm calling the library, it could be the office for Field Artillery Journal mag). I will contact the office to see what they have or maybe they can point me in the right direction. Retirements and budget cuts have occurred but I will dig into it, let you know what I find. It sounds like you've spoken to just about everybody, including the division association. Good luck and I will keep you posted. Thx. CJ Kelly-- We have corresponded before (see way below); my dad was the CO of the 908FAB B Btry, 83rd Inf Div. One of the members of the 83rd group. who does research at the Library of Congress, did a search on my father for me. Because he was an officer, there was a lot of paper work that mentioned him, but much of it was repetitious, mostly lists of soldiers in the B Battery as they changed over time. I also know a researcher who will go to NARA in St. Louis, Myra Miller, where more records are due to arrive (the M-to-Z batch, which would include my John McNamara), and though many military papers were burned in a fire, she has found quite a few good papers that survived or can be reconstructed. For my father, I am hoping that there Are papers there on him, and that they are not duplicate information, and Morning Reports, a good source of information. But I will pursue Ft. Sill and see what they say--always worth a try! And Edgewood Arsenal, he was there. We took a trip last fall to the areas where both of my parents were during the war (my mother was a nurse at an evacuation hospital closest to the Battle of the Bulge, outside Liege), and Myra found wonderful information for me on where my father was at various times, places we visited, like a farmhouse command post, and a church where he was observing as it was being shelled. But of course, I want More information! I guess we will all be pursuing our parents for the rest of our lives. Hi Ms. Hamiliton, can I ask what unit you are researching? Several places could have reports and other info, like NARA. Hi lions44 -- Somewhere below I saw that you hoped Ft. Sill would still come through for you. My father taught at Ft. Sill right after the war, and again at various times over the years for shorter stints (summer camp?) I believe. I never thought to look for information on him there -- Can you tell me what department or person I would approach for that? If it wasn't in the Library of Congress, is it likely they would have anything? I know he also went to Edgewood Arsenal at some point (I don't know my own history!). Thank you for so quickly getting back to me. Yes it was WWII. Any information, no matter how little helps, so I would very much appreciate it. Hi Mr. England, with regards to the cook lying dead in the photo, it is not him. That GI was from a divisional artillery unit. Another person just contacted me through Facebook about the 200th, there is a homepage. I did not see you mention, so I'm assuming you have not seen it. I passed your name along. You can contact several folks there. Hi Mr. Oakley, I'm assuming this is WWII? If so, info is scarce because it was a non-divisional unit. There is some data and reports out there. Working on another unit right now but I can put together a list for you this weekend. Send me an email (link from HP) and I will send the list. I have been trying to find out more information on the service of the 689th FA battalion (155mm). My grandfather Sgt. William Oakley was a Forward Observer for Battery A. Information on this unit has been hard to come by, do you have any notion of how I might find out more about the 689th? Thanks for the quick response and that would be amazing if you could turn up something to add to our story. Please take as long as you need. If you copy this link into the web this is the small booklet I mentioned. It is very interesting and quite humbling. I think he was in the 20th Service Battalion of the 200th Just half an hour ago I purchased a hard copy on ebay from someone in Old Forge Pennsylvania, just 4hr drive from where he lived in Slippery Rocks. These thing never turn up! Glad to hear from you. The 200th was a 155mm Long Tom unit, correct? I have some info. There are vets with home pages, etc. Obtaining information and reports from non-divisional battalions is extremely difficult as the National Archives has not formally cataloged their after actions and daily rosters. But there is stuff out there and I will put together a page w/links. Hope to get it to you by the end of the week. I forgot to ask but if you are able to find out any more information on my granddad or the unit it would be very much appreciated. We have been putting together some information about my granddad recently after putting out a Facebook message. All we had to go on was a name from my gran. His family found out about it and replied. Neither of us including my mother new of each other existed. His name was George Irwin Brown and we have since found out he was a Master Sergeant with the 200th Field Artillery Battalion and was from Slippery Rocks, Pennsylvania. We found on the internet a small book with 17 pages called 200th Field Artillery Battalion and gives a brief history and account of their journey from America to England, D-Day and ending up in Czechoslovakia. It mentions that in the UK they were stationed in a small town in Devon called Torrington. My gran lived in the next town called Bideford where they had a relationship. I don’t know if he found out about my mother before he left or in fact if he ever did? He landed on D-Day +2 and the book covers a few engagements and on the back cover is the list of those killed which list my grandad. We have since been sent some letters from his family that he wrote home but is does not talk about any action or locations due to security and censorship. I found out that there was a book written by two serving men from the 200th at the time who wrote it as they were going along and is a detailed account of their exploits and experiences and has 165 pages. At the end of the war each member was given a copy and is called Scatter Come Together. Last week we found a Facebook group for the 200th and sent them a mail about if they knew of the book as it might mention my grandad. The group owner very kindly sent us a photo copy of the page where it describes in detail how my grandad and three others were driving two trucks from a supply depot in the rear back to their position with rubber tracks for the prime movers on April 18th 1945 (three weeks before the war ended!) and were ambushed by SS. Whilst driving their truck under blackout they found a steel wire across the road and stopped. The SS then opened fire with machine guns and bazookas killing my granddad and PFC Lusk with the other two managing to escape. We are still trying to get hold of the full copy so if anyone out there who can help then please get in touch. 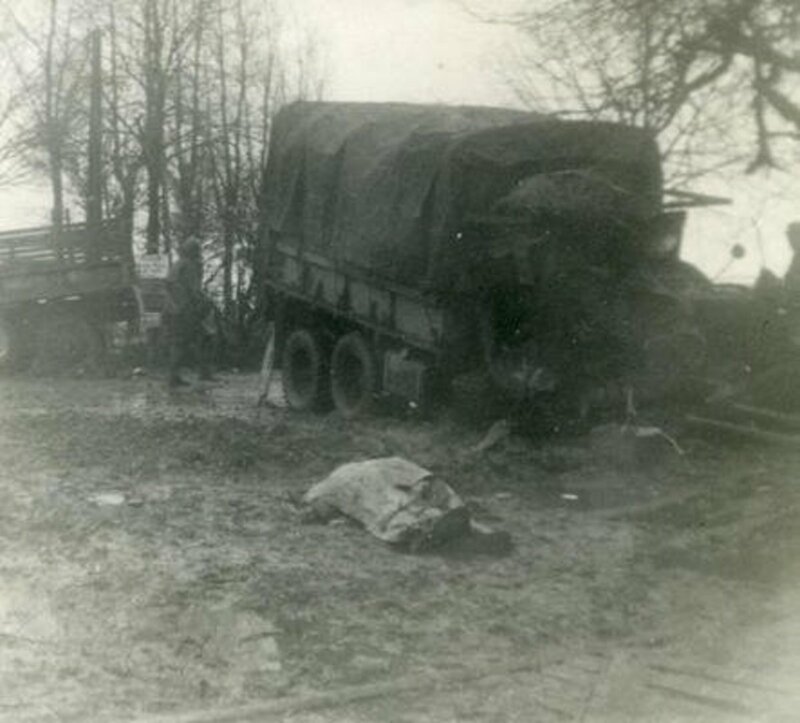 After seeing you very interesting page I noticed the photo of a destroyed truck and a battalion mess sergeant wrapped in a poncho on the ground in April 1945. I am wondering if this could be him? My other granddad was on HMS Iron Duke at the Battle of Jutland during WW1 and was originally called Jack Bishop. After the battle he jumped ship, changed his name to Jack England and joined the Somerset Light Infantry in the army and was sent right to Flanders in the front line. Hi Mr. Rodgers, my so called "sources" turned out to be a dud. So now I'm on to more official information. But overall, finding info on this unit post Bulge is very hard. I'm very rarely stymied, but in this case, hard case. Giving NARA another shot. I did find a guy who runs a blog/website. He apparently has a lot pics, etc. Looks like B Battery only. It appears to me to be more pre Bulge. If I hear back from him, will let you know. But Fort Sill might be come through for me. Will keep you posted. Sorry for the delays. Nothing yet. I have the names of two experts on the 285th. Hoping get something out of that. Also, using my Red Leg FB page to turn something up. I will put an ad up and keep you posted. Please contact me again the first week of December. My uncle Charles David Knight served in WW 2 in Battery B 15th Field Artillery Battalion under the 2nd Infantry Division (Indianheads). He saw his action on D+1 when they stormed Omaha. I am doing a blog on the 182 letters he wrote home while at Camp McCoy and then in the European Theater. Is there a list of the names in his Battery B? We have a group picture of Battery B taken on June 22, 1943. He listed many names and addresses on the back with their location in the picture. Is there a way to know who survived the war in his Battery B? I know his headstone states he was a Sergeant but he must received that at Camp Swift in Texas in the three months before being discharged on October 14, 1945. However I have not been able to discover that fact. His closest living relatives are we nephews and nieces so we appear not to be able to obtain his D D-214. Any help will be appreciated in regards to my questions and my uncle's records. He died in 1984. Absolutely. I'll email you later. Thx. Just great info. I really appreciate it. Thx. Can I ask one more question? - Did you get to Buchenwald at the end of the war? Mr. Burr, I do a "Red Leg of the Week" on my Facebook and I would be honored could send a photo. I'll post your story. No, the increase in FO's had no relationship to the increase in number of guns. In Europe, having one FO for each infantry battalion was unacceptable since it was the infantry company that was basic to infantry operations and each needed to call directly for artillery support. I was a reconnaissance officer in "B" Battery of the 324th Field, 83rd Inf Div - there were three of us in the battalion and we were all sent forward on or around 25 June '44 to inf companies as FO's. That raised the total to 6 - my assignment was to "E" Co, 331st Regt. In Korea I was the Fire Direction Chief as a Major, 64th Field (Lancer 3) - the T&O gave me 3 FO's per firing battery - whether that was a permanent change I have no idea. That is what I had when I arrived and a year later what I had when I left. I suspect that Sill arrived at the conclusion of WWII that the Btry Exec could manage 2 more guns - certainly from my point of view 18 rounds on the target instead of 12 was going to make a lot more noise. By the way I spent 3 months in the Punchbowl and fired only "high angle" fire - artillerymen seldom ever fire "high angle" so this was a unique experience - the max ord on a high angle round can be as much as 16,000 feet in altitude. Hi Mr. Burr. Great to hear from you. Thanks for the insight. Was the increase in FOs officially part of the T&O? Or did the units adjust while in the field during Korea? I assumed because of the increase to 6 guns that there were more observers, but I was not sure if the 3 FO was a standard. During WWII, what was your unit? I believe the 221st was assigned to the Americal Division, which ended up on Guadalcanal at the end of 1942. Since your dad was assigned in late '43, he probably ended up on Bouganville and then the Philippines. The Division has an excellent veterans association which is very helpful to families, see americal.org. My Father was a Pvt with Btry B of the 221st Field Artillery Battalion with the Americals in WWII. He shipped over to the Pacific on 29 October 1943 and returned to the US in late 1945 after being with the occupation forces in Japan. Any information about this unit in the interim would be great! (He passed 10 years ago, having said little about his service!) Thanks! Have been researching my Dad's WWII service for past 2 years. His name was Gayle W. Huston and he died in 1975. He did not talk much about his experience except one instance when he was in Italy as a Forward Observer being shelled so badly one night that his buddy's hair turned white by the next morning. His service records were burned in the ST Louis fire when I contacted NARA and did get one page which stated he spent 20 months with the 894th Ord HAM Co; however, I don't think that is correct. He was with the 2nd FA Obn Bn which was part of the 18th FA BDE prior to WWII. He enlisted Feb 42 and was sent to Ft Sill, then to CP Bowie TX until deployment 21 Aug 1943 from NY to ETO arriving Oran Algeria 2 Sep 1943. From what I have gathered he was with 5th Army as part of II Corps and or VI Corps Artillery through North Africa, Italy, then with VI Corps, VII Army through Southern France, and into Germany. I have his IKE Jacket and photos when he married my mother in Lyon France on 9 Oct 1945 before his re-deployment back to the US 0n 19 Nov 45 from Le Havre France aboard the Monticello AP-61 arriving NY 27 Nov 45. The unit crest on his IKE Jacket is the 2nd FA Obv Bn and he attained the rank of Tech 5. In some of his personal effects was a patch for the 44th Inf Div and a CIB. I can't find hardly any information about the 2nd FA Obv Bn or the 894th Ord HAM Co and am hoping you may be able to help me with any information about either of these units? Also from my research, I discovered the CIB was only awarded to Infantry men in combat but after the war in 1946, an exception was made for other soldiers who fought in direct combat did earn the CIB and thus awarded the Bronze Star. I am hoping to find any information about my Dad's service and whether my Dad could entitled to this award plus the Army of Occupation Medal. Hope you can help. My email is jhuston1440@wavecable.com Much thanks!!! Very informative! My father was a member of the 264th FA Bn, Btry B. How can one find a unit history? We are planning a trip to Europe to retrace the units movements. Hi Ms. Southall, I would like a picture of your dad in uniform. I have an artillery tribute page and try to put up a "Red Leg of the Week" feature a few times a year. Maybe a quick bio on your dad (West Point class, hometown, etc.). Always a popular feature and in some cases, it has brought old friends together. You can either email me, friend me on Facebook or my Red Legs page. I'm also available on Google + or Twitter. The term Red Leg began in the Civil War, First during the Kansas border wars and then the Army adapted it later. It referred to Unionists in the State. Then during the Civil War, the artillery branch began the practice of having red stripes down the side of their pants to distinguish from the infantry (who still wear blue). I left out a lot, but that's the easy synopsis. Hi lions44-- I have a picture of my father in uniform, are you looking for those, or only with the howitzers? Also, where did the term red leg come from? I just read that recently, don't remember where, but couldn't find it at google. Like Ms. Southall, my father was in two different FABs, and someone at the 83rd site said that because he, my dad, was regular army (West Point), he would be staying for the Occupation, which he did, for another year, and that's about when the change occurred, I think, from the 908 to the 323. That baffled me til someone pointed out that in his situation, points wouldn't matter, and exactly what you said--the regrouping of men. And I didn't really think about how the army wouldn't stop practicing, because my father's section, at least, thought they were going on to Japan. Ms. Southall, thanks so much for sharing your dad's story. It was very common for the men to be reassigned to other units after the end of hostilities, as some units were rotated home as well as individual personnel based on points. So the personnel without enough points were kept with other units until their time came up. That is the most likely reason your dad was moved to the 196th. The 406th was probably sent home first as the 196th did occupation duty for a couple of months. I'm not sure that the 196th was part of the 79th. I'll have to confirm that. If you could share a photo that would be great. Thank you so much for sharing this information. 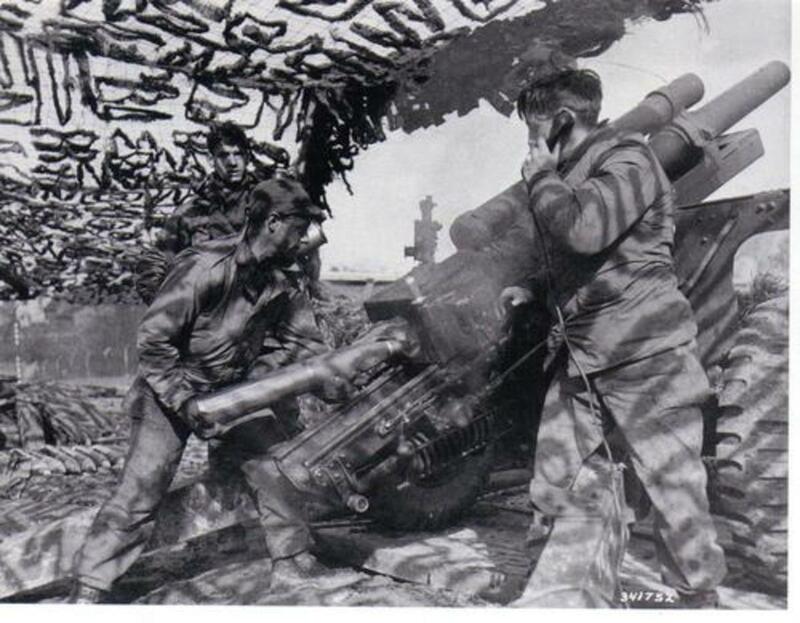 This is the best article I have read on the US Army Field Artillery in World War II. My dad, Eugene F. Southall, was a field lineman (technician 5th grade) with HQ and HQ Battery. He went in with the 406 Field Artillery Group and was discharged with the 196th Field Artillery Battalion. I don’t know why he changed units. I think both were part of the 79th Infantry Division. I’m grateful to have found a book entitled “Under Cover” that in their own words provides a G-rated history of the 406th Field Artillery Group from January 29, 1944 through Ju;y 7, 1945. My dad died in 1987 and never talked much about the war. I do know that he landed in England February 26, 1944 and France on June 14, 1944. He was discharged in NYC on December 26, 1945. He was in Normandy, northern France, Ardennes, Rhineland, and Central Europe. If anyone can share any knowledge or similar experiences, I would appreciate it. I’m especially curious as to why he changed units. Mr. Lister, so glad to hear from you. I'm honored to have helped honor your uncle. If he has any pics he would like to share, please send. I do a Red Leg of the Week on FB page and I'm always looking for new guys. Thx. Our uncle, Richard V. Fritts, was a Technical Fourth Grade in the 993rd Field Artillery Battalion, in the Pacific Theater in 1944 and 1945. He was a Artillery Mechanic and recently celebrated his 99th birthday! 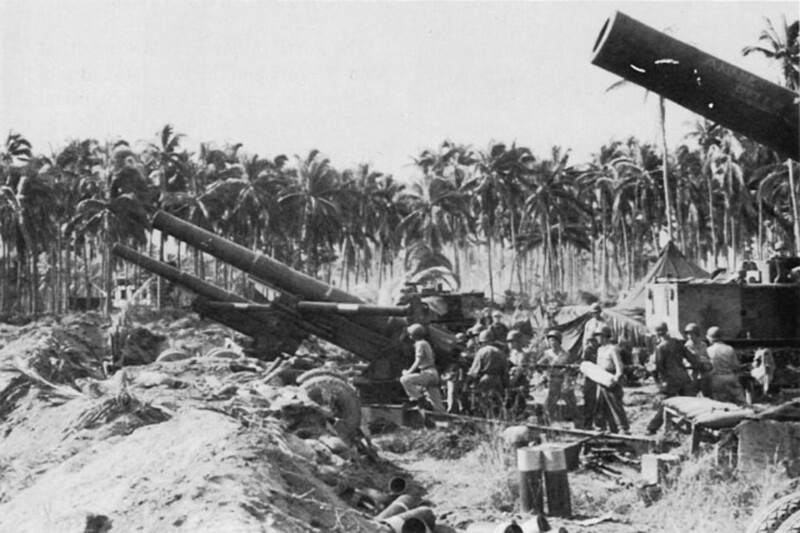 The pictures of the 8" Howitzer in the Phillippines, 1944 really brought back memories! Thank you so much for this information. Thx Greener. I have seen them, but I hope to add them to my You Tube channel soon. Appreciate the reminder. Please pass them on. It's so important these men are not forgotten. Absolutely, Nancy. Will do. Sorry I misunderstood you. Stay well. Yes, I am familiar with, and a member of the facebook page, and have used Dave Curry's site. I meant when you go to the Battle of the Bulge reunion, if you hear of anyone there interested. Thank you. Also, there is a Facebook page for the Division. Type in 83rd Infantry Division. I would love to talk to anyone connected with the 908 FAB B Btry, if there are any descendants who have pictures to share, or stories, if you come across any. I just missed a man who served under my dad, died two weeks before I found him, but I have at least one of his descendants and hope to talk to her. Passion, you are correct. The 808th was part of the 9th Army, XIII Corps. It was a Corps Artillery unit. Can I get your dad's full name and rank? I'm heading to the Veterans of the Battle of the Bulge reunion next month (here in Seattle). So I can ask around about the unit, etc. If you would like to send a photo, that would be great. Use my Facebook page and I can make my "Red Leg of the Week." Thx. 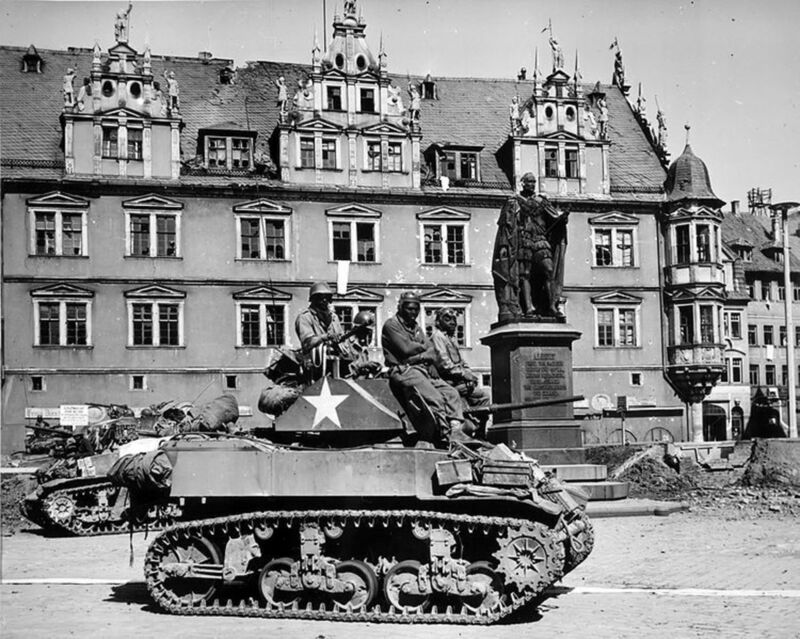 My father served with the 808th Field Artillery BN in the European Theater of Operations in the Battle of the Bulge. He was a Field Lineman 641. He said he belonged to the Ninth Army. He served from Aug. 1943 to Mar. 1946. I believe I saw a post from 2 yrs ago from Scott asking about which Army the 808th belonged to. My father installed communication lines from the observation post to battalion headquarter and to the line batteries, and repaired same. Also operated small switchboards and telephones. Thx, Greener. Keep me posted. lions44: I went back and reread the other portions of your article and tried to delete most of my comments since you had covered them elsewhere. Hi Greener, I thought it was obvious that I was still talking about the 105mm only. As a writer, I should never assume. Appreciate the help. If you see anything else, let me know. I will delete the "especially in the 155mm" portion, which should make it clearer. You had this sentence describing the duties of cannoneers: "Both he and the gunner corporal were also responsible for keeping the crew away from the tremendous recoil of the barrel which could kill or maim, especially in the 155mm. After firing, the breech was opened by the #1 and the shell casing would drop out automatically, where it was picked up one of the loaders to be tossed aside. " 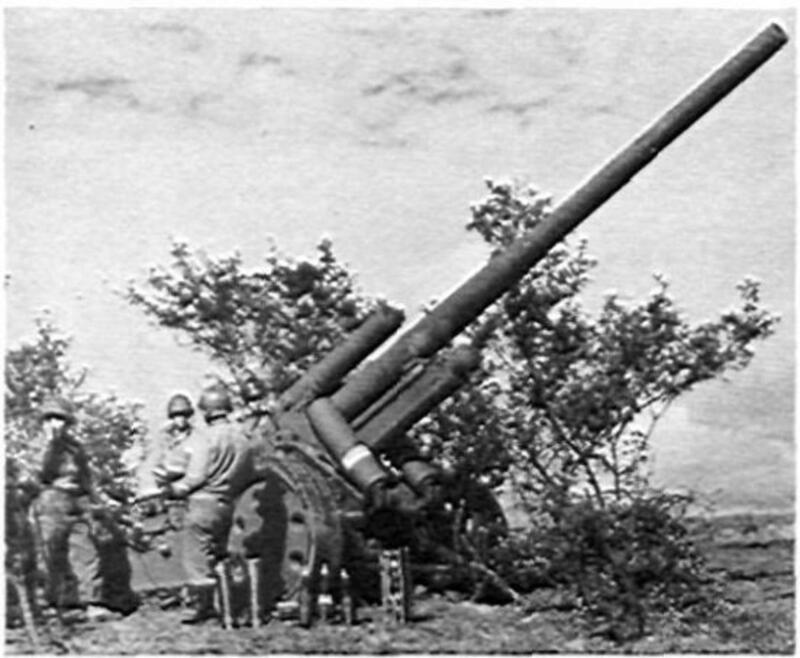 105mm was semi-fixed, i.e., had a shell casing. 155mm ammunition was separate loading, i.e., no shell casing. It was that way for the M114, which was used long after WWII. The 4th BN 333d FA fired it's last rounds from M114's (aka Pigs) in August 1989. The cannoneer duties for US artillery were similar. The round was prepared for firing by (a) replacing the eyebolt lifting plug with fuze of choice (what I believe the cannoneer in your 8" picture was doing); (b) opening the propellant canister (all but 105); (c) preparing the charge by removing excess increments; (d) ramming the round (155's and 8" required at least 2 holding the round at the breech and several on a ramming staff seating the round in the chamber); (d) inserting the powder (on a 105, the powder was in the casing which was rammed with the round); (e) the breech was closed and for the separate loading the primer was inserted in the breech and the lanyard hooked up; (f) gunner and assistant gunner duties as you described and (g) after firing it was usual, at least in my time, to swab the bore of 8" or 155mm to make sure there were no burning powder bags in the breech. Thx, Mr. Burr. I truly appreciate the compliment, especially from someone who has been there. I did not go into the prime movers and FDCs in this article. I have another entitled Artillery Innovations of WWII, which goes into detail on the FDC in particular. Would love to hear what you think. That is an excellently done article on the division artillery of WWII. I was an FO and Survey Officer for the 324th Field in Europe and a Fire Direction Chief in Korea ('51-'52) 64th Field. I don't believe you covered prime movers and I only bring it up because a writer on the 83rd Div Facebook page mentioned that the 155's were truck drawn. Their prime mover was a high speed tractor. I don't think that you got into the fire direction centers which centers were the means by which all the guns of a unit could be brought to bear on a single target. I recall in Hurtgen Forest times when 14- 16 battalions of artillery were fired on a single target (called a TOT). Greener, you are correct. The photo caption should read 8 inch shell. Thx. Thx, Greener. I thought they looked too big as well. However, I went with the original Army Signal Corps caption from the photo. I used the same photo in my book. But I will recheck it and confirm. The projectiles in your photo "Loading 155mm shells" look like 8" projectiles. They just look to big for 155 projo's. Isn't the top marking 8H? Thanks, another good article I need to read. Hi Angela, they are still around, part of the Minnesota National Guard. I assume they were part of the 34th ID during the War. I'll put together something this weekend. Write me back. You can use messaging through HP or my facebook page, Red Legs of the Bulge (clearninghouse for information). I forgot to add that he was in the Army and served from 11-19-41 to 10-12-45. He ended as a Tec 4 FA. My grandfather was a Artillery Mechanic 802 - Battery C 175th FA Battalion. He was in the Algerian Campaign, Tunisian Campaign, Naples-Foggia, and Home-Arno Campaign. Do you know if there is anymore information on this particular Battalion? I wondered what he may have done during WWII? The records are probably gone but there are unit associations that may help. I believe the unit is still in existence as a National Guard outfit (Tenn? ), which means it has a long history. So web sources should be plentiful. I'll check out some of the forums to see what I can find. Also, I'm sure there is a unit historian. Let me know what you find. Note, it was a Corps unit, so info is always tougher to come by. Looking for information on the 181 field artillery ww11. My grand father was a part off the 181st out off fourt ord cal. Can not find any info on him. All records are believed to be gone. I have his flag that is how I know he fought in the war. My dad is a vet that is how i know He fought in vetinam. 3 tours over there. My grand father name is Mack. Hi Nancy. I got the right guy. I sent him one email through his HP account. And I think I may have found him on FB as well. Try him there. Thx. Lions44 -- I just realized that unless he starts over from the top, he won't know that my father was also the CO of FAB Battery B with the 83rd Infantry Division. So can you mention that too? I think that was part of his confusion, officers involved? Sorry! Hi Nancy, as crazy as this sounds, I was just in the middle of writing Robert an email because I was trying to clear any remaining requests for info. But I will get that email out to him today. Hopefully he'll see this message come up anyway. Thanks so much for stopping by again and providing that information. And for Robert Poole -- hope this will interest you about forward observers. A man who helps WWII veterans retrace their steps in Europe told me that my father was probably a forward observer. I don't know about that, but it sounds like it here? 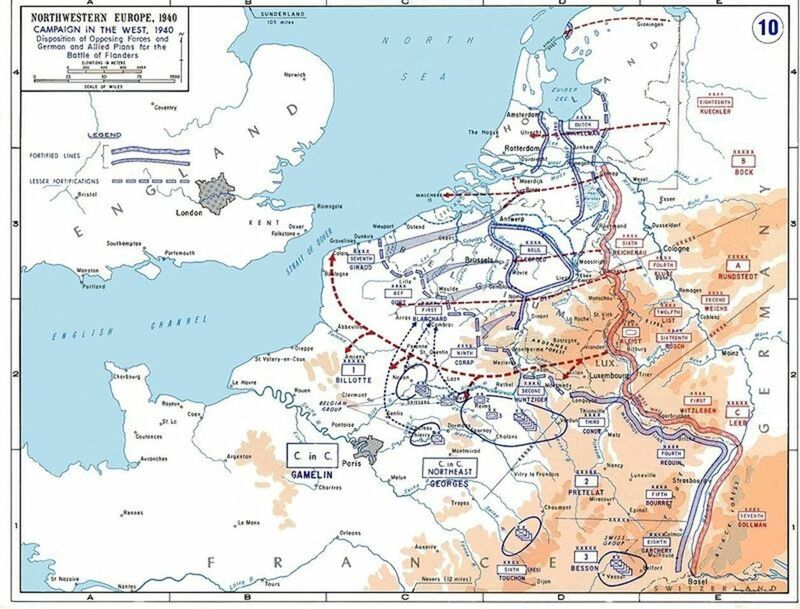 military operations against an enemy of the United States on 18 April 1945, in Germany. tanks overrunning the main line of resistance of one of the lead companies. the enemy crushing the counter-attack. His courage and heroic devotion to duty merit the highest praise and uphold the finest traditions of the military service. Entered United Stateds Military Academy from Ohio. (Lions 44 -- could you send Robert an email too?) As always, thank you for this site! Ms. Kilcullen, glad I could help. If you have any further questions, just let me know. Dad was in Battery C as a loader (I think). I would love to see the pictures and documents. I only have one picture of the guys on VE Day. I am happy to share that with you if you do not have that one. You can reach me at mkilcull@kent.edu. I am trying to pull the information together for my sisters and brothers. Dad passed in 1995. His name was Thomas Kilcullen. Thanks for any information and THANK YOU! to Lions44!!! Hello, Maureen! My dad was Ray Garrett, Jr. of the 264th. A few years ago, another member of that unit sent me the documents and photos that I hope are still around. Let me try to dig them out. I don't know yet how to contact you outside this forum . . . . I'm also quite interested in who your father was and in what way he worked with mine. Ms. Kilcullen, hopefully Mr. Garrett will get a notification that there's another comment and check it out. But I'm sure I can track him down either way. I will keep you posted. Thank you so much for your wonderful and informative site. My dad served in the 264th Field Artillery Battalion, Battery C, under Captain Raymond Garrett. I have been researching the 264th FAB for 5 years. I saw that Richard Garrett posted that he had pictures and a unit history. I would love to see the pictures as well as read the unit history. Is there any way to contact Richard Garrett? Thanks John, I was given a copy of a WWII memoir several months ago called "For Meritorious Service" by Reinard Wulkow, a fellow officer of my uncle. It must be the same book you are referring to because my uncle's death is mentioned on page 34. Prior to uncovering this book I knew very little about my uncle's service or his death. Ray Pinter, have you heard of the book "On The Way". It is about the 195th Field Artillery Battalion. Your uncle mentioned on page 34. Thank you so much for all your help and information. I look forward to your future writings!! Thanks very much, Jennifer. I found some pretty good stuff on the 264th. I'll gather up the links and try to post other search help as well. Please feel free to post your grandfather's photos on my Red Legs of the Bulge Facebook page. Family members have been leaving some great pics and stories about their dads/granddads. I want it to be a gathering place for information. And if you have any more questions, just let me know. I love this article!! Thank you so much for helping me to undestand more about my grandathers time in ww2. I just recenly found pictures of him with the howitzer. He passed away when I was 18 so I really never got a chance to talk to him about the war , and he never really talked about it. He served in the 264th Field Artillery 8 inch howitzer in battery A . I have been searcing for information but can't seem to find much on their group. My son was born on his birthday 14 years after his death and I continue to search so I can tell him all about him. Thanks Mr. Garrett. You should write a hub based on your dad's experiences. The photos would be great. I'll be writing another artillery book soon, so I might be in touch. Great read. To join the crowd, my dad was Captain 264th Field Artillery, 8-inch howitzers, HQ battery, laying wire and communications and, as he said, stuck with "moral officer" duties. Assaulted Omaha Beach on D-Day +30 (or +60) as he joked, to being first artillery battalion across Remagen, and the Bulge. Always loved shooting the 8-inchers but was stuck in HQ, as he put it. Have some nice photos of his unit from then and unit history. What you've written is also very helpful in getting some of it straight and appreciating the experience. Mr. Pinter, as always, I will do my best. Thx for stopping by and I will get back to you as soon as I can. My uncle, LT Robert J. Pinter, was killed in action on Jan.3, 1945 in the Battle of the Bulge. He was with the 195th field artillery battalion, battery C. I would appreciate any information about his unit. http://www.ww2-airborne.us/units/676/676.html. Lots of other stuff on the site. It's great. Hope that helps. Let me know if you need anything else. I wish they were all that easy. I feel bad I can't help everybody. Mr. Hase, I'll take a look. The 676th was a corps unit (I think). As such, might be difficult, but will do my best. I know it's very hard to find things like after action reports and other material for those units.